OVERVIEW: Pour out the laughs and brim over with American spirit as the incredible true story that put Napa on the map of fine wines is uncorked with Bottle Shock, debuting onto DVD February 3rd from Twentieth Century Fox Home Entertainment (TCFHE). 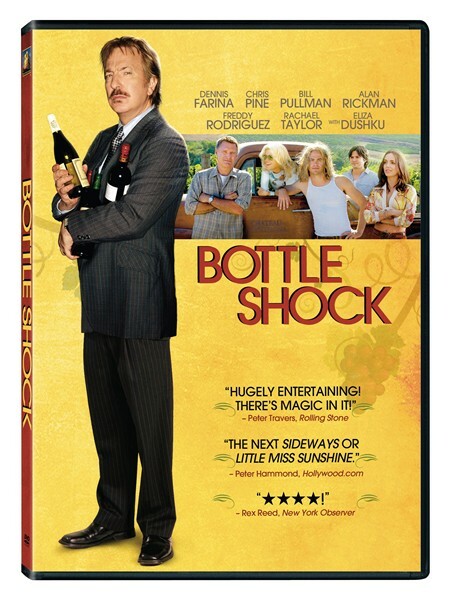 Premiering at the 2008 Sundance Film Festival, Bottle Shock has won the hearts of critics and audiences alike. Praised as “Rocky for wine aficionados” (The Hollywood Reporter), Bottle Shock follows novice vintner Jim Barrett who, against all odds and expectations, defeated the heavily favored French varietals at the 1976 blind taste challenge called “The Judgment of Paris.” An unforeseen victory by any standards, this central event established California and Napa Valley’s reputation as one of the world’s top wine producing regions. Shot on location in the breathtakingly beautiful Northern California wine country and using the real-life Chateau Montelena winery in many scenes, Bottle Shock celebrates the splendor of California wine country which forever changed the face of the winemaking industry. SYNOPSIS: For connoisseur Steven Spurrier (Rickman), there’s no finer art than French wine, despite rumors that the new California wine country holds the future of the vine. Positive the small Napa wineries are no match for established French vintages, Spurrier challenges the Americans to a blind tasting. But when he finds the valley full of ambitious – and talented – novice vintners like Jim Barrett (Pullman) and his son Bo (Pine), he realizes his publicity stunt may change the history of wine forever.